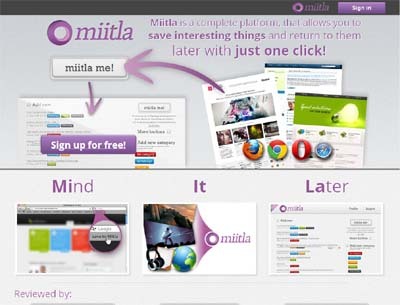 Miitla is a web application that allow you to save sites like bookmarks but on the third party server. With Miitla you can have your bookmarks always with you. Get a bookmarklet for your browser and add sites to Miitla with one click without loggin in. Bookmarklet automatically get all necessary info like: url address, title and description. You can create categories and assign them to your links. Also on mobile browser by adding ‘new.miitla.com/‘ before URL you want to save. It’s design and intereface make it easy to use and concentrate on content not apperance.